Check out our picks from Queer Threads, the colorful book featuring over 30 fiber artists. 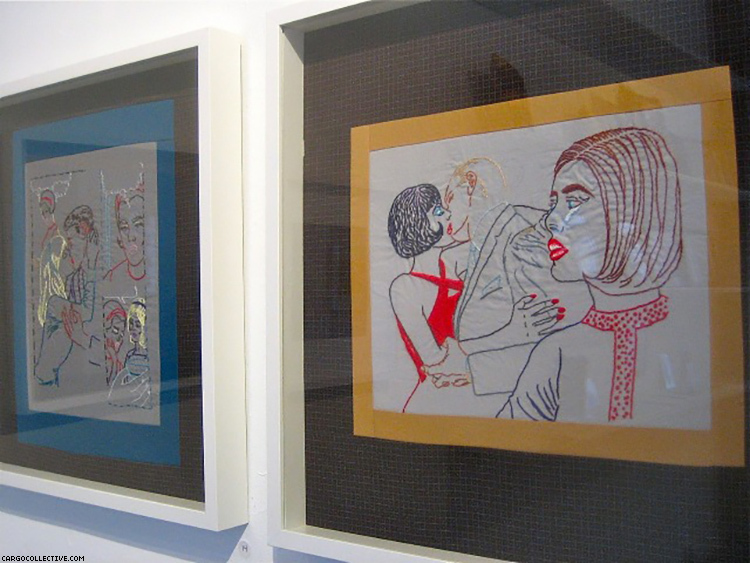 Queer Threads: Crafting Identity and Community is not only a vibrant coffee table book with works from 30 queer-identifying fiber artists by John Chaich and Todd Oldham, but a long standing exhibition. With full-color spreads, a hardcover bind and 192 pages of unparalleled art, this book is too colorful and rich to pass up. These 30 artists are transforming the way we see and make fiber crafts via mixed and tantalizing use of crochet, embroidery, quilting and sewing. The book includes interviews of the artists by creatives in the worlds of dance, design, fashion, media, music, museums, scholarship and more. Bright, joyful, and whimsical, Caroline brings fibers to life with his vast and colorful representations of human-like figures. Based in abstraction, Caroline hand-crochets towering figures with extraordinary use of color and shapes. His work explores sexuality, history, and, of course, queerness. From 2010 to 2012, Slutsky was a curator at the Pop-Up museum of queer history. 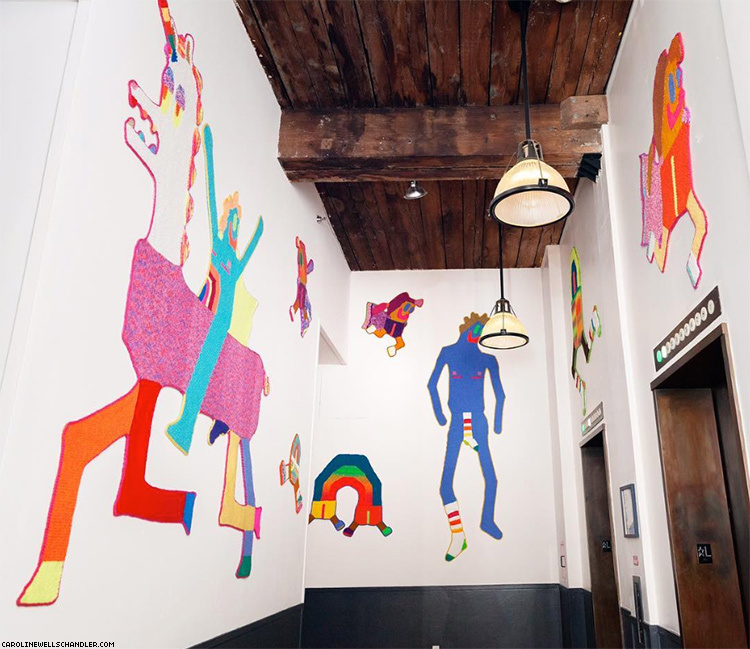 Since then, Slutsky has continued to organize and create LGBT-centered art. As a creative writer and curator whose practice incorporates drawing, sculpture, performance and video, Slutsky has created impactful fiber-art pieces that explore what is means to be trans. Jade uses a variety of art techniques to express himself and his vivid queerness. Of Jade’s many works, our favorite are his fiber works defined as “queer sculptural monsters” which he incorporates in a live performance. 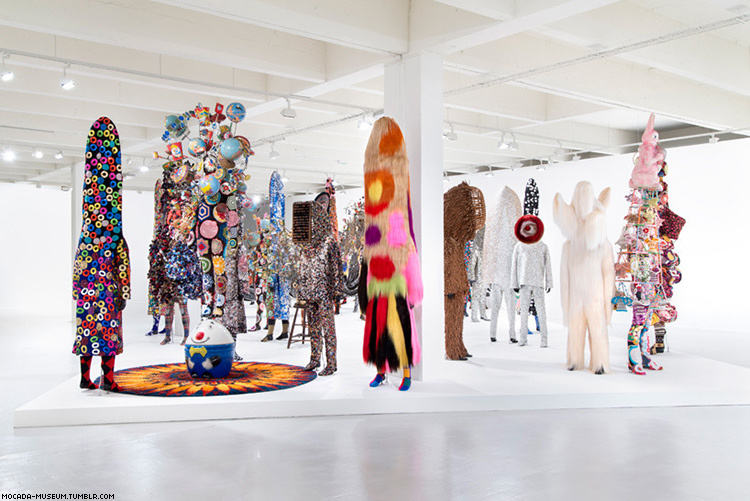 He also makes larger-than-life installations out of fibers, textiles and found objects that mesmerize audiences. 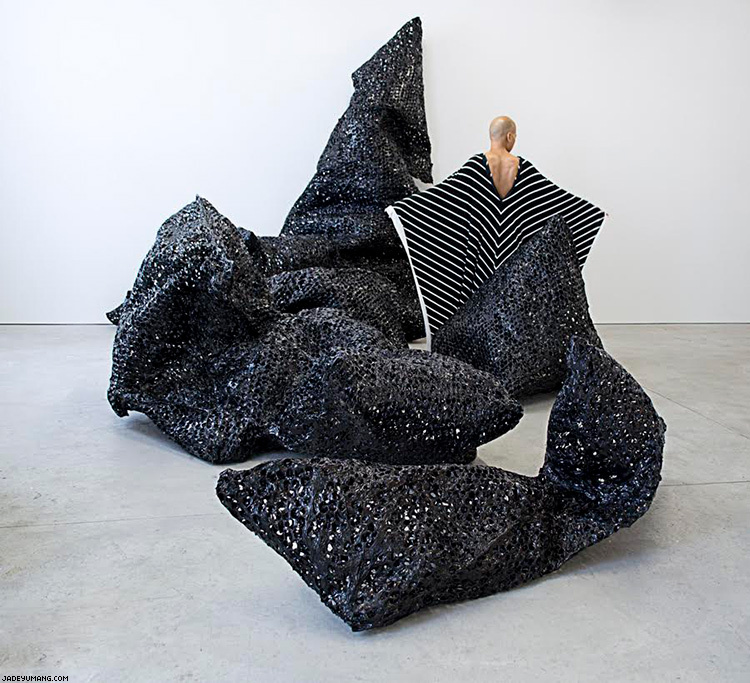 Nick is an uncatagorizable artist whose work fuses sculpture, installation, performance, video, fashion and design. 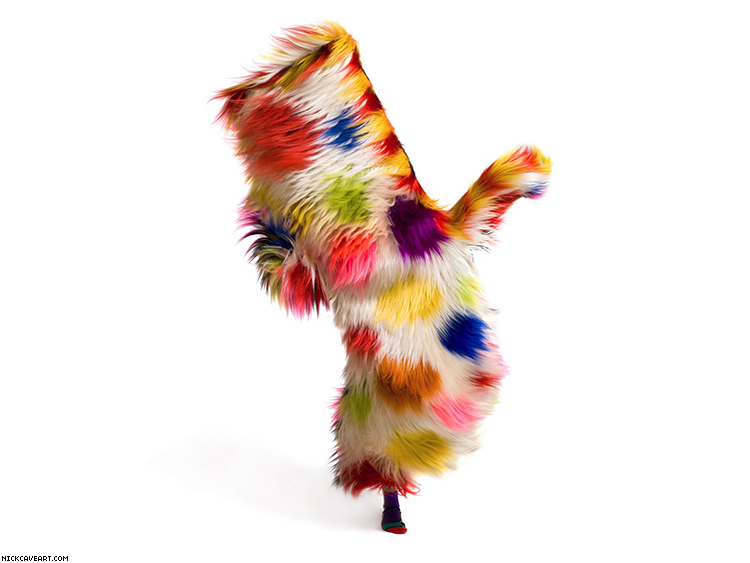 Nick creates flamboyant, wearable pieces with hairs and fibers that come alive with movement. His woven and sewn creations often cover the entire body and face. Nathan is a fiber artist who textures yarn, fiber techniques and crochet to make in his own technique to create 3D figures. 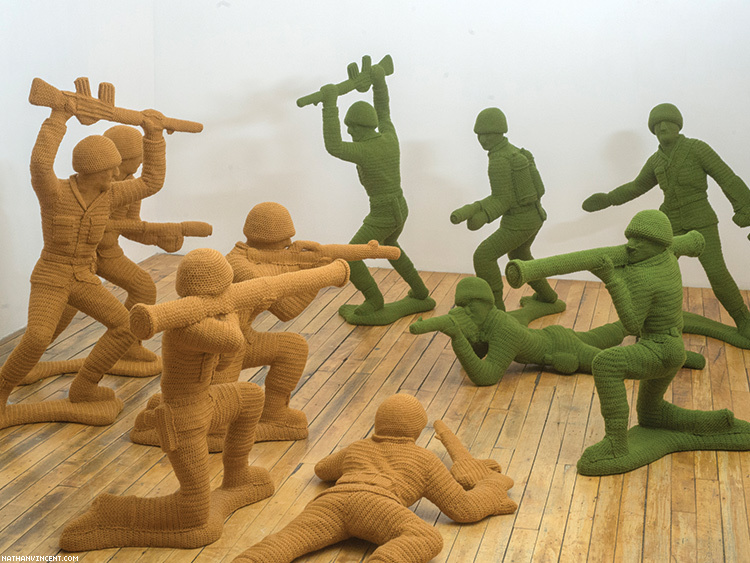 His textile covered sculptures range from small objects like sewn grenades to large-scale installations like a heap of crocheted dynamite adorned with an ignition lever. Colorful and precise, Nathan’s work explores gender roles and the challenges that arise from breaking the norm. 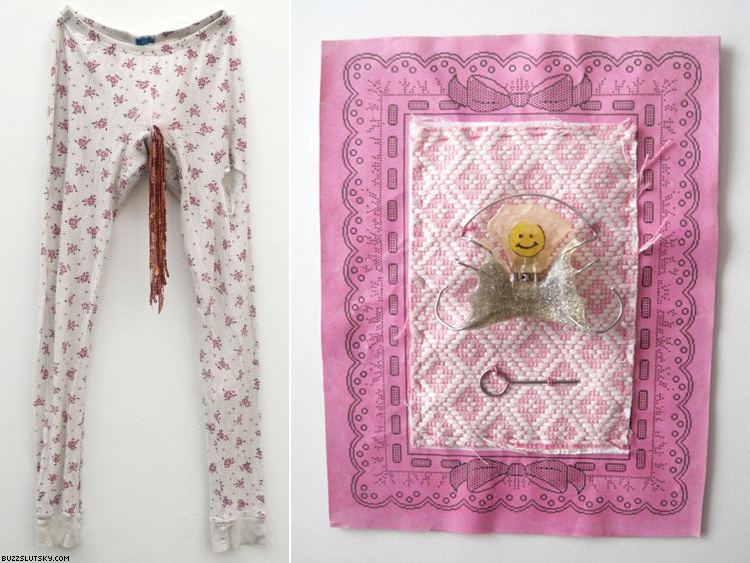 Rebecca’s work redefines American domesticity and desire through textiles that mix handcrafting, vintage physique magazines inspired elements, pin-ups and comic books discovered at New York City flea markets. Her embroidery work mounts flat on a wall like a painting, yet exhibits 3D elements as stitches pop off the surface. 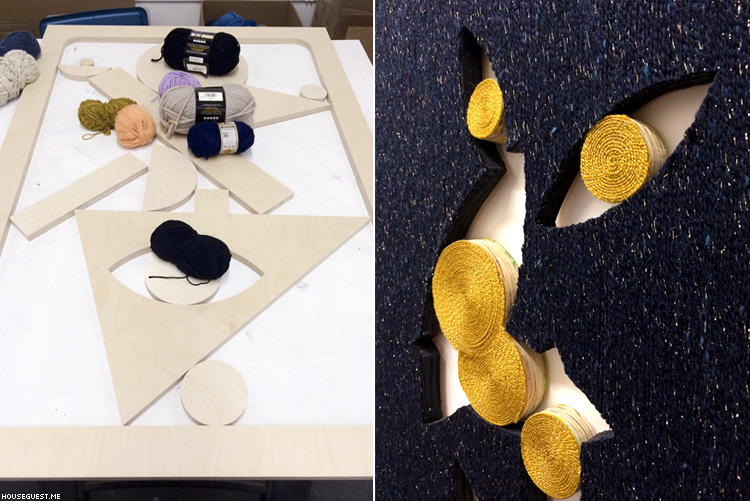 Chris Bogia’s most recent works are hybrid painting-sculptures made of yarn and plywood. His works incorporate traditional design in their careful placement and composition. Prior works consist of large sculptural installations that incorporate and transform design objects, sexual ephemera and record sleeves into altar-like structures that he uses as sets for photographic work.